A 23-year-old man has been jailed for seven years after a knife attack in Elland left his victim needing 20 stitches in a neck wound. Sean Lockley pleaded guilty to wounding Ben Wysneski with intent to do him grievous bodily harm in relation to the slashing which happened in the town back in June 2015. Lockley, of Grange Street, Halifax, was not charged with the offence until March this year and he entered his guilty plea in September. 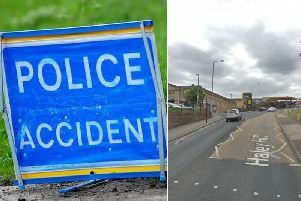 Bradford Crown Court heard how Mr Wysneski had been test driving a car with friends in Elland when he saw Lockley near a house on Elizabeth Street. Prosecutor Clare described how the defendant jumped into the road and put his arms out as if inviting Mr Wysneski to fight. After Mr Wysneski got out of the car Lockley came towards him with what was described as a craft knife in his hand and the complainant started backtracking his steps. Mrs Walsh said Mr Wysneski was repeatedly saying put the knife down and we’ll sort this out and he attempted to kick the knife out of Lockley’s hand. But Lockley grabbed Mr Wysneski’s foot with his free hand and then brought the knife to his neck. “Mr Wysneski immediately realised that his throat had been slit,” said Mrs Walsh. His friends used a coat to apply pressure to the wound and the complainant described feeling light-headed and thinking he was going to die. At hospital he had to have 20 stitches put in the wound and he has been left with a scar across his neck. The Honorary Recorder of Bradford Judge Roger Thomas QC sentenced Lockley to seven years in jail for the offence and imposed a extra two years of prison licence. The judge also imposed an indefinite restraining order which bans Lockley from having any contact with his victim. Barrister Stephen Wood, for Lockley, said although the photograph of the injury was “visually shocking” the medical opinion was that it was a superficial injury. Mr Wood said it had been a single blow and if his client had wanted to do more harm he could have followed up the attack. He submitted that Lockley was still a young man who had an awful lot of growing up to do. Speaking after the sentence DI Gary Stephenson, of Calderdale CID, said: “This was a vicious attack on a man that wanted no confrontation. “The outcome could have been far more serious, if not fatal.